Help staff to engage all students and improve academic outcomes with equitable practices and social and emotional learning (SEL). Research shows that students of color (especially African-American students) receive significantly higher rates of disciplinary action. This can have lasting effects on students and may impact their future education, employment, and income. As education professionals, we have a responsibility to implement equitable practices in schools and communities and ensure that all students are treated fairly — no matter their race, ethnicity, gender, family income, disability, cultural background, or religious affiliation. SEL and Positive Behavior Intervention & Supports (PBIS) can help educators foster equity and address the root cause of disproportionate disciplinary actions and referrals while simultaneously providing a flexible framework that addresses the unique needs of a school. Start Implementing Equitable Practices Right Now! In order to disrupt inequity in schools we must examine our own unconscious biases and strive to overcome them. 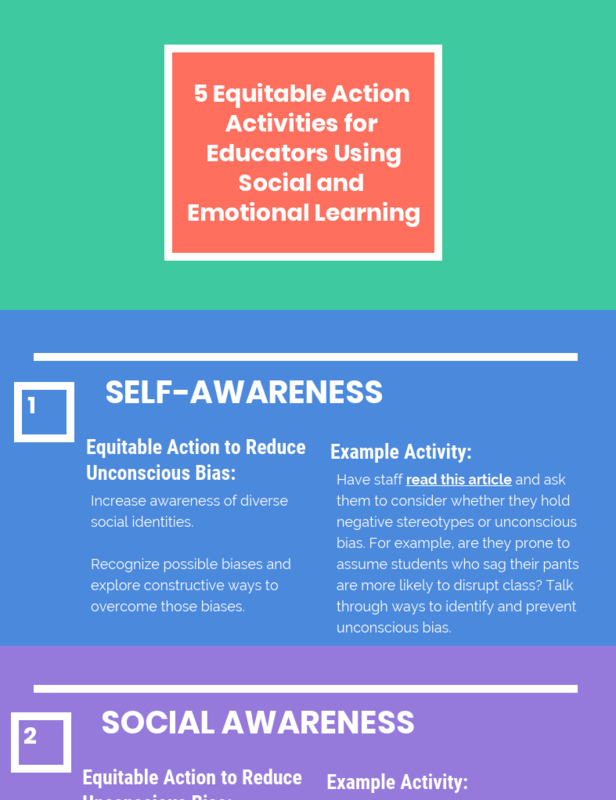 Check out our Promoting Equity Through PBIS and SEL blog post to learn more about SEL and equitable practices in schools. Then, feel free to download or print this free activity sheet and share it with your staff to help boost their social and emotional competence while increasing their knowledge and practice of equity. Research shows that universal social and emotional interventions can help all students improve academically, regardless of race or family income (AEI/Brookings Working Group on Poverty and Opportunity, 2015). As part of our social and emotional learning solution, Aperture Education provides access to Foundational Practices — actionable ideas that educators can use to set positive expectations and goals for their students. These Foundational Practices include Trauma-Informed Practices, which help educators understand how to support their students who have been adversely affected by traumatic experiences. Click here to download the Trauma-Informed Practices Teacher Notes, one sample of what we provide to our customers through our system, the DESSA Comprehensive SEL System. Want more information? This presentation from the Collaborative for Academic, Social, and Emotional Learning (CASEL) illustrates the connection between SEL and equity, and tells educators what they can do to make improvements in their classroom. Schools and districts can learn from one another by sharing best practices to improve equity in schools. This webinar, hosted by CASEL, explores how two districts — Chicago Public Schools and Tulsa Public Schools — are integrating SEL and equity within their schools and community. The Devereux Student Strengths Assessment (DESSA) is a standardized, strength-based assessment that measures students’ social and emotional competence in grades K-8. Grounded in resilience theory, the DESSA helps educators promote equity and the social and emotional strengths of children. Social and emotional competence, as measured by the DESSA-mini, was found to be a better predictor of students’ reading and math achievement than socioeconomic status (LeBuffe & Robitaille, 2016). Academic achievement and DESSA scores are strongly correlated for students of all races, even after controlling for family income. After controlling for DESSA scores, many of the associations between race and academic achievement disappeared, and the association between poverty and low academic achievement decreased (Chain, Shapiro, LeBuffe, & Bryson, In Press).